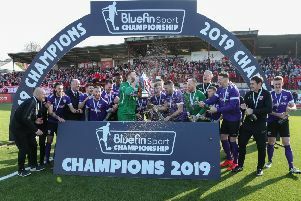 Almost to a man, Larne supporters believe they have potentially the best manager in Championship 1. But they probably ain’t seen nothing yet. With exciting plans for the club, as outlined last week in this paper, their boss has now had the benefit of a season-and-a-half under his belt. And within the next week, Davy McAlinden is hoping his CV will be well on the way to being boosted even further. That’s because the Larne boss is about to embark on the extremely rigorous and demanding coaching course that is part and parcel of obtaining a UEFA ‘A’ Licence. “It’s all part of the education and there is an intensive week of hard work to be done this summer and then again next summer,” he explained. “It starts on Saturday and runs right through Sunday and all next week until Friday night, from 9am to 9pm daily, with practical activity on the park during the days and lectures in the evenings. “The on-pitch stuff is at The Dub, while the lectures and assessments are in Stranmillis, so it’s going to be quite an experience for everybody involved. But this is only the first part. The process isn’t concluded until this time next year. “I successfully completed my exam for the ‘B’ Licence a couple of years ago and there were lots of full-time professionals going through it at the same time, Aston Villa goalkeeper Shay Given being one of them. “From what I’m hearing there are going to be quite a few managers and coaches from England, Scotland and Wales involved, as well as possibly Americans and guys from other European countries, so it’s quite a big undertaking. The Inver Park boss is presently sounding out opposition for an expanding series of pre-season games. “I have a few promises but nothing I can reveal at the moment because they are not yet cast in stone, and I don’t want to be talking about tentative fixtures before they are properly pencilled in,” he said.